Our Napoleon candelabra in the beautiful room designed by Mabley Handler for Kip's Bay Palm Beach. 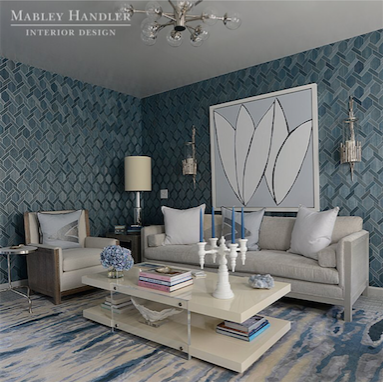 The room, awash in blue and white with touches of silver also includes a number of pieces from Mabley Handler's line for Kravet furniture as well as a silk-accented rug from Stark Carpet and a contemporary coffee table from Mecox Gardens. The Mabley Handler designed room at Kip's Bay Palm Beach. The three-dimensional looking wallcovering is by Phillip Jeffries and the large piece of art over the sofa is from Mark Humphrey Gallery. The pillows are by one of our favorite textile designers, Michelle Hatch NYC, who can be found on instagram at @michellehatchnyc. If you are attending Kip's Bay Palm Beach and see this gorgeous room, please share it with us on Instagram and tag us at @dunesandduchess! We'll be sure to regram it!